We buy ALL gold and silver and pay the best prices in the market! Our pawn shop in Tempe, also serving Scottsdale, Mesa and Chandler is determined to give you the most cash for your gold. We have over 20 years of experience in buying all types of gold, therefore, we have the knowledge to know how much your gold is worth. No one is a better gold buyer in Tempe. We want you to come back and see us, which is why we pay higher than our competitors in Tempe. Our staff includes expert 2nd and 3rd generation jewelers, and expert watch analysts who specialize in buying gold and other jewelry. Not only will we pay you the most for your gold, but we will explain the process to you so that you fully understand why your gold is valued the way it is. If you’re looking to buy gold, our staff will help you in every step along the way. We have a large inventory of gold jewelry that is for sale at discounted prices in Tempe. Come see why we’re the top gold buyer today. Visit our store at The Broadway Marketplace if you are looking to sell jewelry, sell gold, sell diamonds, sell gold watches, sell gold coins, or sell estate jewelry. 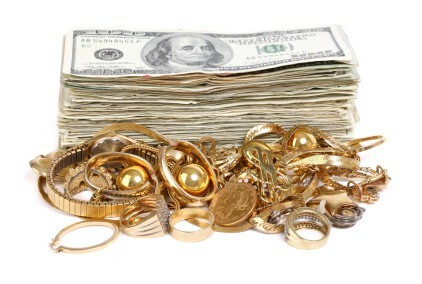 We will give you top dollar for any type of gold including broken or damaged jewelry in Tempe. This is what makes us the best gold buyer in town. The process for letting Tempe Pawn and Gold be your gold buyer is quick, simple, and easy and has been streamlined over our decade plus years of business to better serve our customers. It all begins when you just bring your gold jewelry, or gold coins, or even gold bars, down to Tempe Pawn and Gold in person. Once you get here, one of our lovely associates will take your piece of gold and inspect it to initially verify that it’s a piece of gold jewelry we can buy. Quick note here — there is no gold piece of jewelry that we will ever buy, but the inspection process is an important step in the process for the both of us! During this inspection process, the associate will be looking for a stamp that is typically either going to indicate 10kt, 14kt, or 18kt. The higher the karat, the higher the purity, and the higher the cash we can place in your hand! This stamp is typically found on the inside of a ring, or on the clasp of a gold jewelry or gold earring. Afterwards, we’ll collect a few gold flakes from the piece itself and do what’s known as an acid test to go ahead and verify the actual purity. Most of the time, the stamp matches the actual karat purity, but it’s always good for us to just make sure. Last, but most importantly, we’ll take the gram weight of the item as this is where the primary amount of our cash offer comes from. Once this is all said and done, we’ll make you an offer on the spot that, should you accept, will put cold, hard cash into your hand. Aside from that, we just collect a few signatures, and you’re off on your way. Tempe Pawn and Gold and its affiliated companies has been in business over 20 years buying and selling all types of gold. We have the knowledge, experience, and cash to make you want to come back and see us, therefore, you can be sure you are getting the most money for your gold in Tempe. Conveniently located in the Broadway Marketplace at Broadway and Rural Roads, our pawn shop in Tempe also serves Scottsdale, Chandler, and Mesa.